Herzogiella moss growing on a rocky outcrop along West Beach on Calvert Island. Photo by Ian Cruickshank. Herzogiella moss is a medium-sized moss with widely spreading leaves that give it a bristly appearance. It belongs to Class Bryopsida, and subclass Bryidae. It was formerly listed as Campylium stellatum. This moss forms lawns and small hummocks. It grows in wet and seepage sites, including fens, from sea to subalpine elevations. 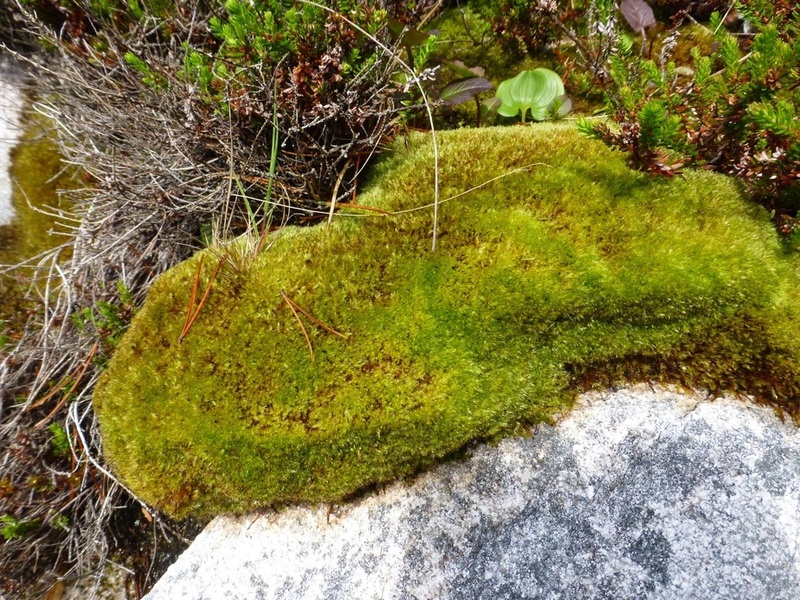 The mat pictured above was found growing in the wet cracks of a rock outcrop at the north end of West Beach, Calvert Island. Click here for records of this species in BC. Schofield, W.B. (1992). Some Common Mosses of British Columbia. Victoria, BC: Royal Britsh Columbia Museum. Pp. 92-93. Vitt, D. H., Marsh, J. E., and Bovey, R. B. (1988). Mosses Lichens & Ferns of Northwest North America. Vancouver, BC: Lone Pine Publishing. P. 93.